If you've seen the nursery, it will come as no surprise to you that I love the color peach. But I have to say, having a baby girl has taken that to a whole new level! I like to think of peach as her "signature color" (haha!) and it seems it has also become mine. I thought I'd share a few things I've been lovingly lately in this pretty shade. 1. I've been adding pops of peach to our hearth room and this pretty pillow from Society 6 would be perfect! 2. The Corkcicle is one of my new favorite things! I got it for Christmas in this rose gold color and absolutely love it. It keeps beverages hot for 12 hours and cold for 25...amazing! It was on Oprah's list of favorite things, so you know it has to be good! 3. I bought these skinny cords from Loft in tropical sands (a peachy/taupe color) and absolutely live in them. Comfy and sophisticated. 4. I just found a beautiful peach throw at TJ Maxx for our hearth room, and this pretty one is quite similar. I love the pop it gives to a neutral space! Here it is in our hearth room (photo from my IG feed). 5. Can you have enough Rifle Paper Co? I don't think so! This peach floral phone case is perfection. 7. I don't know about you, but I can't get enough of abstract art right now. 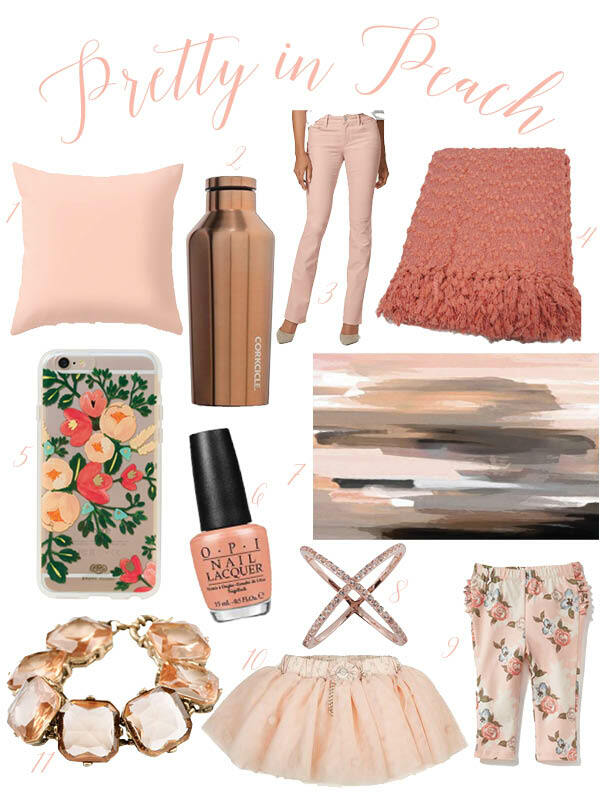 This peach watercolor is trendy and classy. 8. I recently gifted myself an X ring and can't wait to put it on each morning. Mine is gold, but it's so pretty in rose gold as well! 9. I just had to throw in a few peach baby items : ) I may have bought these Old Navy peach floral leggings in multiple sizes so she can keep on wearing them as she grows! 10. You may recognize this darling peach tutu from the nursery. So precious! 11. This peachy bauble from Joss and Main is just the sort of thing I love to toss on in the morning for everyday glamour. What color are you loving lately? Have I converted you to the peach-loving camp?! I love that throw - it looks so perfect in your room. So happy to see you blogging again! You've been slowly converting me to peach! Awww thanks! Glad to be back! Yelp, I'm still reading and was missing you so much I visited the archives. I follow you on instagram too. I am soooo happy to see you back. Glad that you are back! I have been checking daily for awhile now. Excited to see what you share. Oh my goodness so sweet of you Krista! Glad to be back! Wow, you have a beautiful home and I also love peach. Its one of my favorite color. And I am glad you are back. Do post occasionally to keep in touch with your readers. Have a nice day.